Here we have the feature loaded model with elegant looks. 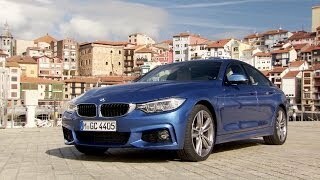 BMW introduces its four-door BMW 4-series Gran Coupe M Sport Package 2015. The M Sport Package adds additional stars to the already convincing BMW 4-series Gran Coupe. 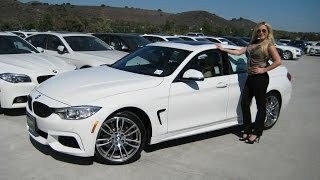 Let us have a look at the review of BMW 4-series Gran Coupe M Sport Package 2015. Interior of BMW 4-series Gran Coupe M Sport Package 2015 gets some special standard features that make it distinct from the Coupe version. The lieu begins with M door sill finishers and M Leather three spoke steering wheel mounted in front of Sport seats with either SensaTec or supple Dakota Leather upholstery and M driver’s foot rest concluding. Apart from these the rest of the features inside remain the same as that in other trims. Offering 4+1 seating, BMW 4-series Gran Coupe M Sport Package 2015 is spacious enough to make your ride comfortable. Behind the sporty steering wheel is located a black panel look round instruments while a flat-screen iDrive monitor not only elongates the features list but also adds to the looks. 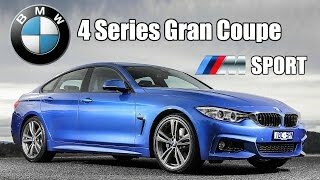 Exterior of BMW 4-series Gran Coupe M Sport Package 2015 will grab the eyeballs with its face pasted with the kidney grille amidst the LED dual headlights. Front apron comes in three parts; the center comes housed with large air intakes while the sides portray vertical inlets for Air Curtains. 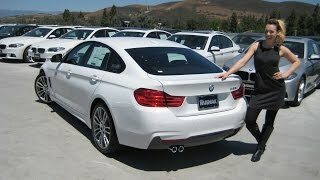 Looking from side BMW 4-series Gran Coupe M Sport Package 2015 looks bit different from the coupe version. Sloppy roofline and Rocker panel trim that matches the color of vehicle looks unique. Adding to the sporty look are the 18” and 19” alloy wheels. Moving towards the rear end you’ll notice rear bumper that comes with diffuser insert. 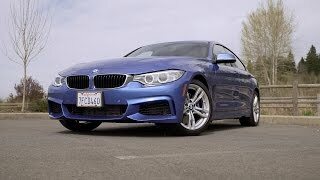 Beneath its hood BMW 4-series Gran Coupe M Sport Package 2015 brings five engine options: The 435i brings 3.0 Liter Six-cylinder petrol engine generating 306 hp and combined fuel consumption being 8.1 L/100km while CO2 emission being 189 g/KM. Second and third are with a four-cylinder generating 245 hp and 184 hp namely 428i and 420i respectively. Fourth is 420d delivering 184 hp and last the 418d with total output of 143 hp.